Marcel Brown's timing is wonderful. Just days before the first anniversary of Steve Jobs' death, Brown cleaned up and uploaded his recording of Jobs in fine form from 1983. It's fun, forward-thinking stuff, covering everything from how Apple wants to "put an incredibly great computer in a book that you can carry around with you and that you can learn how to use in 20 minutes" - a device that is, of course, "magical" - to the dangers of letting technology put people out of work. At a time when many sites are doing the "If Steve were alive today, he'd hate/do/think X" thing, it's a nice reminder of Jobs the man, not the traffic magnet. It's also a nice reminder of how much things have changed. Brown's blog post is illustrated by a photo of the cassette he'd recorded the Q&A on, and as I was listening to the recording my young daughter came in, pointed at the image and asked what it was. She's a child of the iPod and iPad generation, and cassettes are as alien to her as wax cylinders were to me. Steve Jobs played a big part in that. Would Steve have done X, thought Y, bollocked Z? I've no idea, and neither has anybody else. What I do know, though, is that products he imagined, oversaw or obsessed about have been a huge part of my life. My various i-devices have accompanied me on big trips and little ones, epic adventures and emotional events, sharing good news, bad news, births and deaths. I've used countless bits of Apple kit for writing words, making music, forming new friendships and alienating enemies. My daughter dances across endless iPhone photos and iPhoto uploads, soundtracked by songs she's heard in iTunes or on iPods or that she's ad-libbed into the iPad, and my videos of her stream from iMac to our Apple TV. Steve Jobs played a part in all of those things. Not necessarily a big part - he didn't take the photos, sing the songs or write the code - but a part nevertheless: the things that mean so much to me are often directly connected to products Apple made or technologies it popularised. The world we live in now is uncannily like the one Jobs described back in 1983. 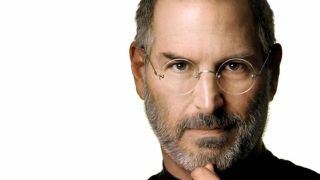 That's one of the reasons the tech industry misses him so badly: Steve Jobs didn't just dream. He delivered.